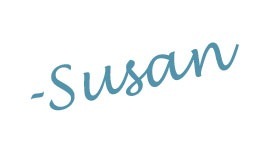 Princess Bathroom Updates – Uniquely Yours… or Mine! 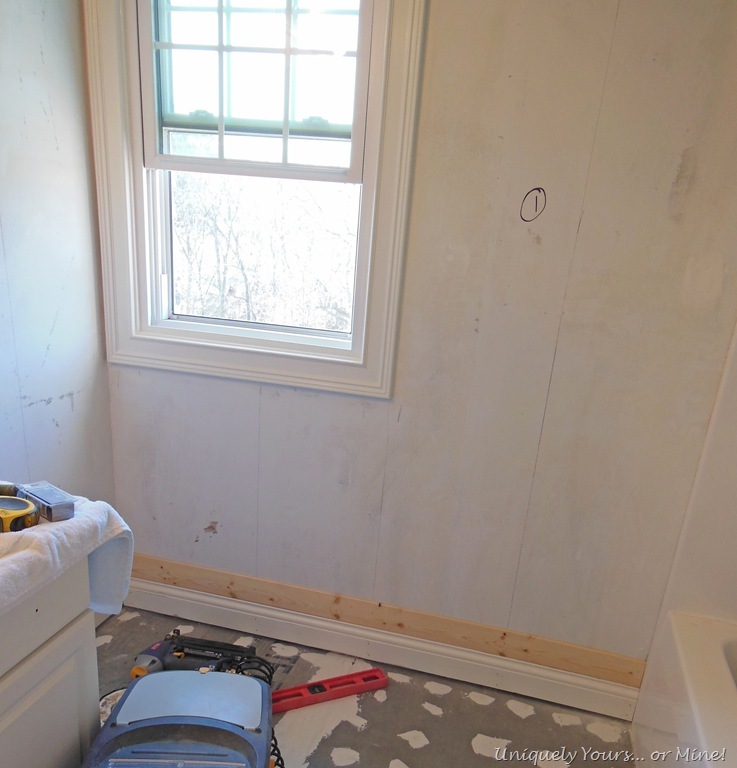 Well I’m happy to say that we made pretty good progress on the “Princess” bathroom the last few days or so… unfortunately it was a beautiful weekend here in Louisville, KY this past weekend and we basically spent it inside working on the bathroom . However, my Hubby was not complaining as he was the one cutting all of the wood outside so he would much rather it have been 70 degrees than 50! So the first thing we did was install the under mount sink and faucet on the granite. We chose to install these while the granite was upside-down because otherwise we would have had to remove the drawer runners and quite honestly this was just the easiest way. 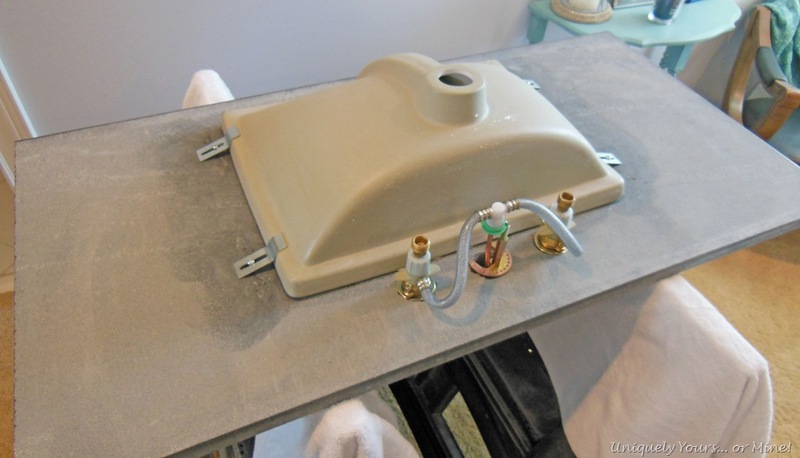 The process is as follows: align the sink over the whole appropriately, mark on the granite the sink placement, remove the sink, put down a bead of granite caulk, replace sink and attach hardware… easy-peezy just a little nerve racking! The faucet install was just a matter of following the included instructions, which was also easy and made much easier with so much access! We let this sit for 3 days before we installed it. We reinstalled the baseboards and started our planking leveling each board as we went. 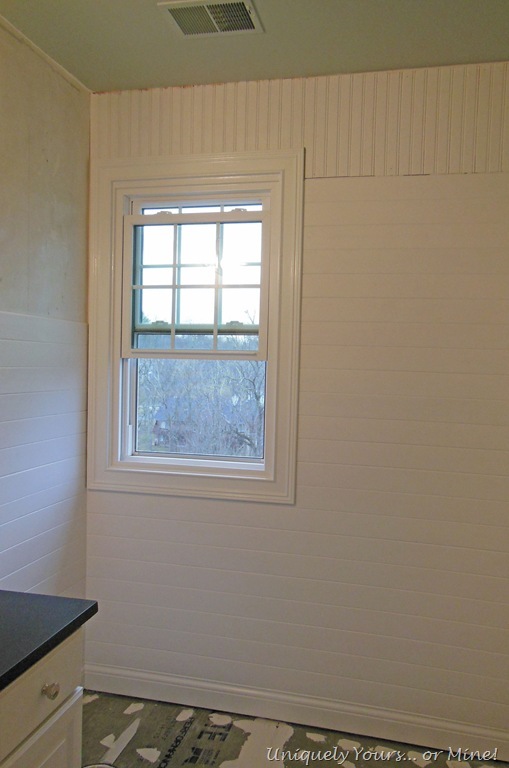 We are using the same process and V-groove planking and bead board we used on the other girls bathroom. We didn’t finish all of the planking (explained below) but I went ahead and primed and got one coat of paint (BM Decorator’s White) on what we did have installed. We had to take a pause here in the planking because the new sconces haven’t arrived and I want to place the mirror and dry fit the sconces before we decide where to install the new junction boxes for them. 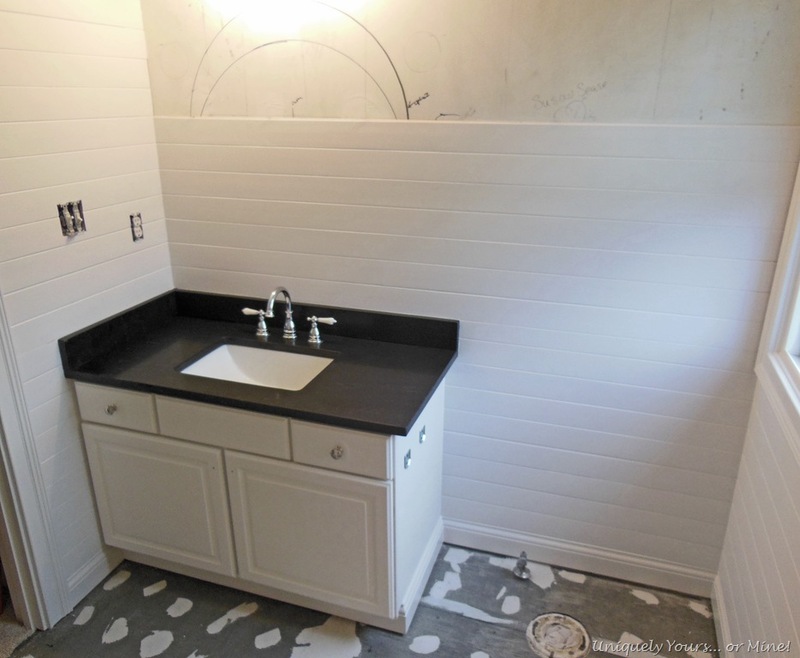 We installed the granite and backsplashes which was as easy as applying a bead of silicone caulk in the top edge of the vanity cabinet then placing the granite on top and ensuring levelness. The backsplashes are adhered to the wall with caulk as well. 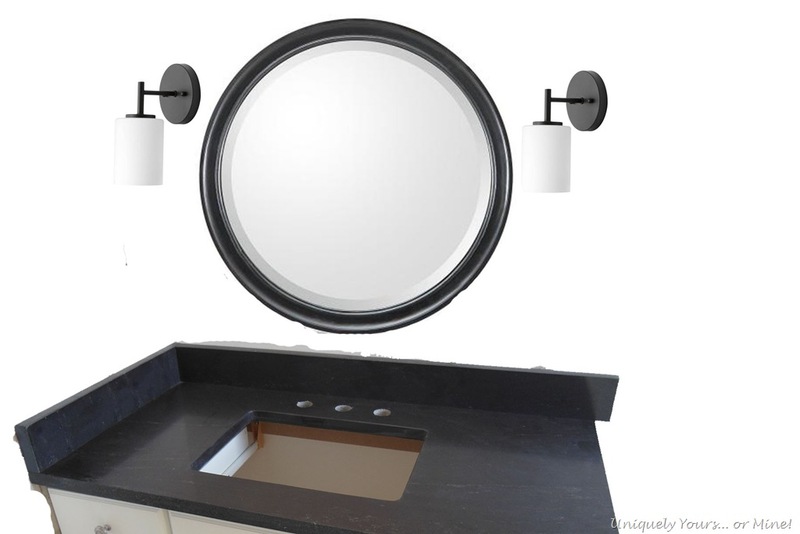 This is my SUPER fast mock up of the mirror and sconces… I’m hoping I like them as much in person as I do in the photo! I also found a few items for the bathroom that I’m excited to mix in! This cute little hanging basket from World Market! 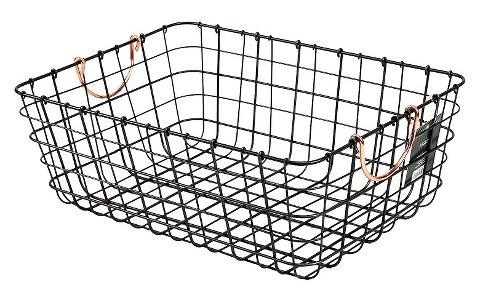 These baskets from Target for the little linen nook. And this fun canvas print from Joss & Main that brings the bedroom colors into the bathroom. 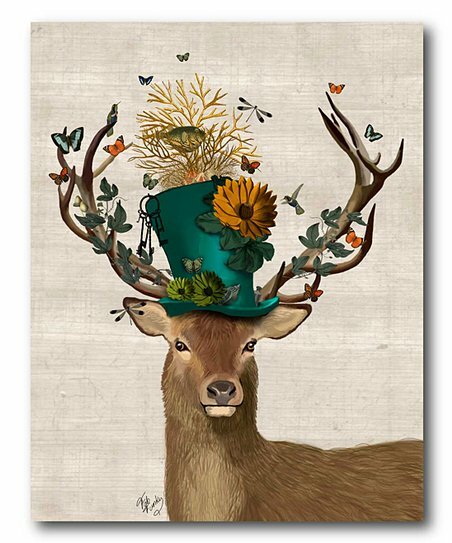 I just love the whimsical feel of this piece! Next Post: Still working on the Princess bathroom!